A rare recording in every way, from the unique pairing of B.J. 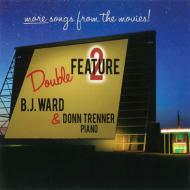 Ward and Donn Trenner to the collection of seldom-heard, exquisitely-crafted songs from film and theatre! Actress and cartoon voice artist B.J. Ward is the voice that greets everyone who comes to Disneyland, Disneyworld, and Epcot Center. She has spent 12 years as an opera singer, touring the country with her one-woman show Stand Up Opera.